He appeared on the 1870 census taken at Providence RI, listed as a jewelry clerk. He was a partner c 1880 with Ezra Spencer Dodge in Providence RI as DODGE & ADAMS, manufacturing jewelers. He appeared on the 1880 census taken at Providence RI, listed as a salesman, living in his father-in-law's home. A. Bigelow Adams and Ezra S. Dodge, of Providence, R. I.
Specification forming part of Letters Patent No. 335,100, dated February 2, 1886. Application filed March 14, 1885. Serial No. 158,882. Be it known that we, A. Bigelow Adams and Ezra S. Dodge, of Providence, in the State of Rhode Island, have invented an Improvement in Ear-Knobs, of which the following is a specification. 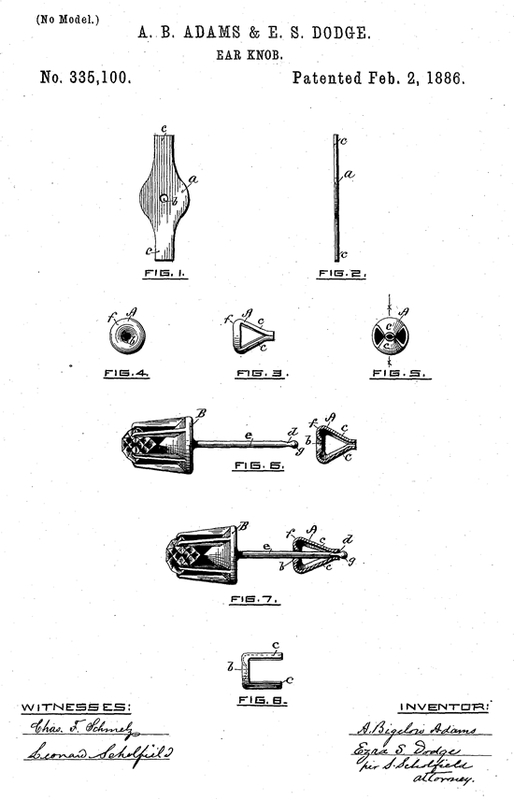 Our invention relates to the spring-fastener for securing the stem of the knob within the perforation of the ear; and it consists in a peculiarly-constructed spring locking device, and in the improved combination of such device with the stern of the knob, as hereinafter set forth. Figure 1 is a plan view of the blank from which our improved spring - fastener is constructed. Fig. 2 is an edge view of the same. Fig. 3 is an edge elevation of the spring-fastener completely formed. Fig. 4 is a front end elevation, and Fig. 5 a rear elevation, of the same. Fig. 6 is a side elevation of the ear-knob, with the spring-fastener shown in section removed from the wire stem of the knob. Fig. 7 is a side elevation of the ear-knob with the spring-fastener in its locking position on the stem of the knob, and shown in section. Fig. 8 represents aside elevation of the spring-fastener in process of construction. In the accompanying drawings, a, Figs. 1 and 2, represents the sheet-metal blank from which our improved spring-fastener is formed, being provided with the perforation b and the two opposite arms, c c, which serve to form the spring portion of the device. The blank a is first to be placed in a die and swagged into the cup form shown in Fig. 8, the surrounding metal at the edge of the perforation b being thrown inward, as shown in the section, Fig. 6. The cupped piece shown in Fig. 8 is then to be placed in a die and swagged to the form shown in Figs. 3 and 5, the arms c c being made in hollowed form at their outer ends, and thus adapted to fit the annular groove d, made on the stem-wire e of the knob B, as shown in Fig. 7. When the spring-fastener A is placed over the stem-wire e, as shown in Fig. 7, the hollowed spring-arms e c will engage with the groove d, and thus hold the fastener in proper place upon the wire; and in case it is desired to remove the fastener a sufficient amount of pressure against the cup-formed end / will cause the arms c c to open from each other and pass over the knob end g of the wire e.
The exterior surface of the cup-formed end f serves to secure a desirable rounded bearing against the back of the ear, and in placing the fastener upon the stem e the end g is first passed through the hole b, and thence between the hollowed ends of the springs c c, as shown in Fig. 7. We are aware that it is not new to combine a spring-fastener with the notched stem-wire of an ear-knob. We therefore make no general claim to such devices, but only to the improved construction and arrangement shown and described. The combination of the knob provided with the notched or circularly-grooved stem, with the spring-fastener having a cup-formed base adapted to form a bearing against the ear of the wearer, and the integral hollowed spring-arms extending in a backward direction from the knob and engaging with the notch or groove of the stem, substantially as described. He appeared on the 1900 census taken at Providence RI, listed as a manufacturer.